John Allegra, an emergency medicine physician in Morristown Memorial and his brother Don Allegra, an infectious disease physician in Morris County, recently returned from a 10 day medical mission in Honduras. They worked in a region of subsistence farmers living in small villages in a mountainous region of the country near the Nicaraguan border about four hours from the capital of Tegucigalpa. 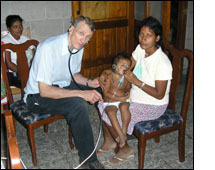 They treated patients in free clinics in the villages of Palestina and Nueva Choluteca and also traveled to some surrounding isolated mountain villages where they made house calls on ill patients who had no access to medical care. The whole area was remote and patients often walked hours to be seen in one of the clinics. They saw as many as 100 patients per day. Many of the patients had fungal rashes, skin wounds, intestinal parasites, and musculoskeletal complaints related to working in the fields. A Peace Corps volunteer in Honduras served as one of their interpreters. Another interpreter from the U.S., who had been working in the communications field, enjoyed the experience so much he has decided to apply to medical school.